Hypertension (high blood pressure) is a leading cause of death worldwide. It’s a major risk factor for heart disease and strokes and causes damage to kidneys and other organs. It is so common in older people in Australia and other developed countries that it has been considered a normal part of aging – but it need not be so. Blood pressure does not rise with age in communities who subsist on minimally processed plant-based diets. Even within developed countries, individuals who follow vegan diets have a quarter of the risk of hypertension as those who eat meat. Nutrition research has established many specific links between diet and hypertension. Obesity, dietary salt and low vegetable intakes all increase the odds that individuals and communities will develop high blood pressure. Your doctor may know that the DASH diet is an evidence-based dietary approach to treating hypertension. It was designed to give patients many of the benefits of a vegetarian or vegan diet while still including some meat in the diet. The vegan group in The Adventist 2 Health Study had a quarter of the prevalence of hypertension compared to the ‘omnivores’. It is important to control hypertension in the long term and we endorse the evidence-based use of medications to maintain blood pressure within safe limits. However, whole foods, plant-based nutrition has a powerful therapeutic effect on hypertension and most individuals will eventually be able to reduce and often stop their medications when there is a high level of adherence to this approach. We recommend that changes to medication only be made under medical supervision. It may sometimes be necessary to reduce medication within the first weeks of dietary transition to avoid excessively low blood pressure. A log of home blood pressure measurements may assist your doctor to ‘deprescribe’ medication as your health improves. ‘Essential hypertension’, elevated blood pressure with no apparent cause, is a lifestyle disease. Genes can make us more susceptible to the lifestyle factors that increase blood pressure but are rarely the cause hypertension on their own. The physiology of hypertension and the effects of lifestyle are complex but the simplicity of just eating whole plant foods addresses most of the underlying causes of this disease. Hypertension may be a smart physiological response by our bodies – increasing the pressure to push more blood through an impaired vascular system. Reducing the pressure with drugs does not treat the cause but it does reduce the risk of stroke and other complications. A lifetime of exposure to a typical Australian diet can causes irreversible changes that contribute to a gradual increase in blood pressure with age and increasing rates of hypertension. Long term hypertension further accentuates some of these changes. The large arteries that form the trunk and major branches of our arterial tree stiffen such that they no longer stretch and recoil with every heartbeat to smooth out the pulse pressure – resulting in an elevated systolic (top number) blood pressure. The kidneys decline in function and become less efficient at excreting excess salt and fluid – the retained fluid causes blood pressure to increase. Smaller arteries can become narrowed by plaque, limiting flow, and stimulating a compensatory increase in blood pressure. Other changes to arteries and regulatory systems further accentuate the disease. The hypertension may pass a ‘tipping point’ (analogous to the climate change concept) and treating the cause, diet and lifestyle, may not bring it back to normal, but it will always help. Arteries are living dynamic structures and what we eat at every meal enhances or inhibits their capacity to dilate when appropriate. The arteries all over our body must maintain some muscle tone to avoid the scenario where every artery relaxes at the same time, causing a catastrophic drop in blood pressure – known in medicine as ‘shock’. The muscular tone of arteries is controlled by the tile-like endothelial cells that line the arteries and produce a locally acting hormone, nitric oxide, that causes the artery muscle to relax a little. Anything that damages the endothelium – eg meat, oil, processed food, smoking – increases arterial tone throughout the body, raising the pressure needed to maintain blood flow. A healthy plant-based diet minimises things that damage endothelium – saturated fats, TMAO etc – while at the same time providing ingredients that protect the endothelial cells – eg antioxidants – resulting in a subtle relaxation of arteries all over the body leading to a reduction in blood pressure. Weight management is important. Excess body fat and the metabolic changes that are associated with abdominal fat and high dietary fat and calorie intake raise blood pressure through multiple mechanisms. Reducing the overall Energy Density of the diet and managing behavioural aspects of eating is the simplest, healthiest way to maintain a lean body in the long term. Salt (sodium) has not been exonerated as a cause of elevated blood pressure, although some people may be more salt sensitive than others. The ratio of sodium to potassium is also important, as are some of the other minerals found in plants. Dietary fibre and other phytonutrients are probably also important. Eat a large amount of a variety of vegetables and other whole plant foods and you won’t have to worry about any of these nutrients. Sodium may need to be restricted to quite low levels to effectively reduce blood pressure eg. 1200mg per day or less. Whole plant foods contain way less sodium than this but many everyday foods like bread and sauces contain a lot more sodium. Meals that are very high in fat can make our blood cloudy, sludgy and difficult to pump through the smallest blood vessels, the capillaries – this may result in a compensatory increase in blood pressure. Fat-laden blood is also damaging to the endothelium. Back to endothelium: age and long-term exposure to damaging foods and lifestyles can leave us with a reduced number of endothelial cells, reduced capacity for nitric oxide production and greater sensitivity to anything that impairs endothelial cells. Even small amounts of animal products, fried foods and vegetable oils (even olive oil) may be enough to keep blood pressure elevated when the endothelium is already damaged. Clinicians who treat cardiovascular disease with whole plant foods are unanimous in their verdict – No Oil! Endothelial function is maximised by high adherence to a low fat, phytonutrient rich WFPB diet. Dietary nitrates can give a further tweek to the blood pressure lowering effects of WFPB and may even improve athletic performance. Dietary nitrates are converted to nitrites with a little help from our mouth bacteria (so no antibacterial mouth washes) and these nitrites provide damaged endothelial cells with a substrate for nitric oxide production. Research has proven that dietary nitrates reduce blood pressure. However, the response takes 2-3hr and lasts less than 24hr, so you will need to eat nitrate rich foods several times a day to take full advantage of this effect. Beetroot juice was used in this study as it was easy to administer and could be compared with a nitrate-reduced placebo, but leafy green vegetables are an even richer source of nitrates and provide other phytonutrients. Dr Esselstyn is correct in recommending that his heart disease patients eat green leafy vegetables several times daily. We recommend incorporating leafy green vegetables into your breakfast as well as other meals. The therapeutic dose for blood pressure treatment and sports performance enhancement is approximately 8mmol of nitrates, which is the amount in half a cup of beetroot juice or 200g of spinach, a typical leafy green vegetable. These studies used single ‘doses’ and lesser quantities may be enough to top up blood nitrate levels when these foods are consumed frequently. Normal blood pressure is 120/80 or less. Hypertension is defined a blood pressure of greater than 140/90 (on more than one occasion and measured at rest, following recommended protocols for accurate measurement). 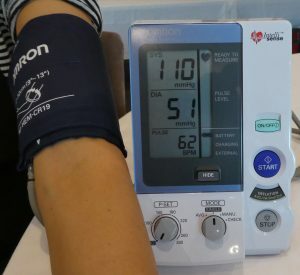 A lower blood pressure, 110/70 or less, is typical of healthy groups of people and is associated with even lower cardiovascular risk – it’s been suggested as a target for high risk patients. However, pushing blood pressure this low with pharmaceuticals increases the risk of drug side effects – whereas blood pressure reduction brought about by WFPB and lifestyle only has good side effects. The bottom line is that a whole foods, plant-based diet – high in whole grains, tubers, legumes, vegetables and fruits – will optimise your blood pressure, and virtually all people with hypertension will improve and most will be able to reduce or cease their medication. Some individuals will need a high degree of dietary compliance to get full benefits – minimal salt, absolutely no oil and avoidance of fat-rich plants as well as coffee. 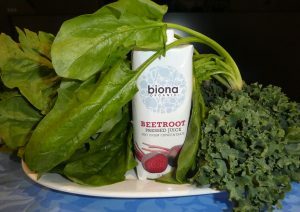 Some specific plant foods such as leafy green vegetables, high in nitrates, actively reduce blood pressure. Regular exercise will further reduce blood pressure. Do not stop your blood pressure medications without medical supervision. Oxygenating Blood with Nitrate-Rich Vegetables (video) – Dr Michael Greger, also this blog post: Which Vegetables Have the Most Nitrates? Appel, L. J., Brands, M. W., Daniels, S. R., Karanja, N., Elmer, P. J., & Sacks, F. M. (2006). Dietary approaches to prevent and treat hypertension: A scientific statement from the American Heart Association. Hypertension, 47(2), 296-308. Appleby, P. N., Davey, G. K., & Key, T. J. (2002). Hypertension and blood pressure among meat eaters, fish eaters, vegetarians and vegans in EPIC-Oxford. Public Health Nutrition, 5(5), 645-654. Borgi, L., Curhan, G. C., Willett, W. C., Hu, F. B., Satija, A., & Forman, J. P. (2015). Long-term intake of animal flesh and risk of developing hypertension in three prospective cohort studies. Journal of Hypertension, 33(11), 2231-2238. Goldhamer, A. C., Lisle, D. J., Sultana, P., Anderson, S. V., Parpia, B., Hughes, B., & Campbell, T. C. (2002). Medically supervised water-only fasting in the treatment of borderline hypertension. Journal of Alternative and Complementary Medicine, 8(5), 643-650. Kerley, C. P., Dolan, E., James, P. E., & Cormican, L. (2018). Dietary nitrate lowers ambulatory blood pressure in treated, uncontrolled hypertension: A 7-d, double-blind, randomised, placebo-controlled, cross-over trial. British Journal of Nutrition, 119(6), 658-663. Mattos, C. B., Viana, L. V., Paula, T. P., Sarmento, R. A., Almeida, J. C., Gross, J. L., & Azevedo, M. J. (2015). Increased protein intake is associated with uncontrolled blood pressure by 24-hour ambulatory blood pressure monitoring in patients with type 2 diabetes. Journal of the American College of Nutrition, 34(3), 232-239. McDougall, J., Litzau, K., Haver, E., Saunders, V., & Spiller, G. A. (1995). Rapid reduction of serum cholesterol and blood pressure by a twelve-day, very low fat, strictly vegetarian diet. Journal of the American College of Nutrition, 14(5), 491-496. McDougall, J., Thomas, L. E., McDougall, C., Moloney, G., Saul, B., Finnell, J. S., . . . Petersen, K. M. (2014). Effects of 7 days on an ad libitum low-fat vegan diet: the McDougall Program cohort. Nutrition Journal, 13(1), 99. Yokoyama, Y., Nishimura, K., Barnard, N. D., Takegami, M., Watanabe, M., Sekikawa, A., . . . Miyamoto, Y. (2014). Vegetarian diets and blood pressure: A meta-analysis. JAMA Internal Medicine, 174(4), 577-587.